Powerful VIN Scanner app for professional automotive shops to easily scan Vehicle Identification Numbers (VINs) and enter license plate information for their AutoZone Commercial accounts. Automatically syncs with AutoZonePro.com to search and order auto parts. Easily manage vehicles and contact your local AutoZone teams. Quickly and accurately identify vehicles by VIN number lookup, license plate lookup, or manual lookup. Use vehicle information to find and order parts at AutoZonePro.com. 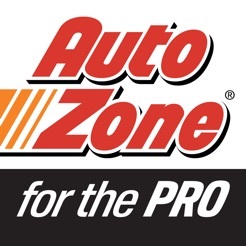 You must have an AutoZone Commercial account and an AutoZonePro.com login to use this app. More setup or login help: 1-866-853-6459. Thank you for using AutoZone! We make updates frequently to improve your experience. Background improvements to adding vehicles and analytics. Unless it has functionality beyond VIN lookup, this doesn’t change anything, especially since the license plate look-up on the desktop version is just as accurate given Autozone’s info (they can only look up YMME; they can’t identify differences between HD and standard chassis, which alternator amperage a vehicle has, what diameter rotor, etc.). If there were a way to submit an order via this app there would be a value component, this just feels like they’re playing catch-up with WorldPAC and NAPA and others who have had this functionality and more for many years. The AZPro site is great, just use that and save phone space. I manage a quick lube right next to an AutoZone. Tried to use this app to order parts for my customers every day for 6 days in a row, but it never opens. Just shows me a white screen. Worked the first and second day I got it, but not since then. I still have to call the commercial manager to order parts and then it takes them 30 minutes to get me the part....I’m only a quarter mile away! The O’Reillys 3 miles away is much faster.